We proudly use American farmed soy wax and blend high quality fragrance and pure essential oils. Because each and every batch of all natural soy wax can vary due to temperature and climate changes, we are always striving to ensure the best consistency by continuing to hand-pour in small batches. Trim the wick down to 1/4" prior to burning to ensure a clean-burning flame. Leaving the wick too long may cause the flame to enlarge which will burn the wax faster and shorten the lifespan of your candle. Avoid moving around the candle when there is melted wax because this can change how it burns after the wax hardens. To extend the life and scent shelf-life of your candle, we recommend not to burn a candle for more than 4 hours at a time. One of the reasons why we love soy wax is because it is easy to clean. Warm water and soap will clean any candle residue. Stop burning the candle when there is 1/2" of wax left in the glass. After the candle has cooled, place the glass in the freezer for about 30 minutes. Once hardened, take a plastic fork or knife and poke the wax causing it to break apart from the glass. Gently pull off the metal wick. Wash the glass with dishwashing liquid and it can be reused as a drinking glass. 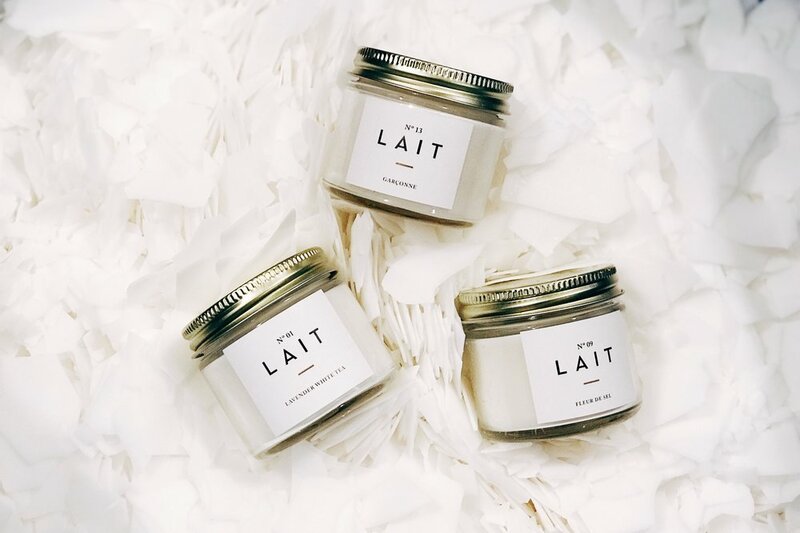 Each and every LAIT candle has been made by hand including the assembling and packaging process. While small batch-pouring ensures attention to detail, variations in appearance from soy wax may occur and should not be considered a defect. We do not use any coloring additives or dye so it can naturally change depending on fragrances added. If the candle is not burning properly where the flame goes out on its own or if there are any other issues, email us at info@shoplait.com and we will replace your candle right away.